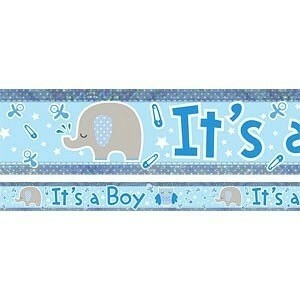 It's a Boy Elephant Banner is ideal for use at a baby boy themed baby shower (it would go with the boy umbrellaphants range also) or to celebrate the birth of a baby boy. The holographic banner has a pastel blue shimmery background and is decorated with the words 'It's a Boy' on the front and back of the banner. It features an adorable blue elephant with miniature nappy pins and dummies surrounding it.